Columbia Hills Resident, Henry Ashby gets ready to cut the ribbon celebrating the Grand Opening of his new home. APAH President and CEO, Nina Janopaul (far right) and APAH Board Chair Kevin Yam (rear left) join community and financing partners who made the project possible. 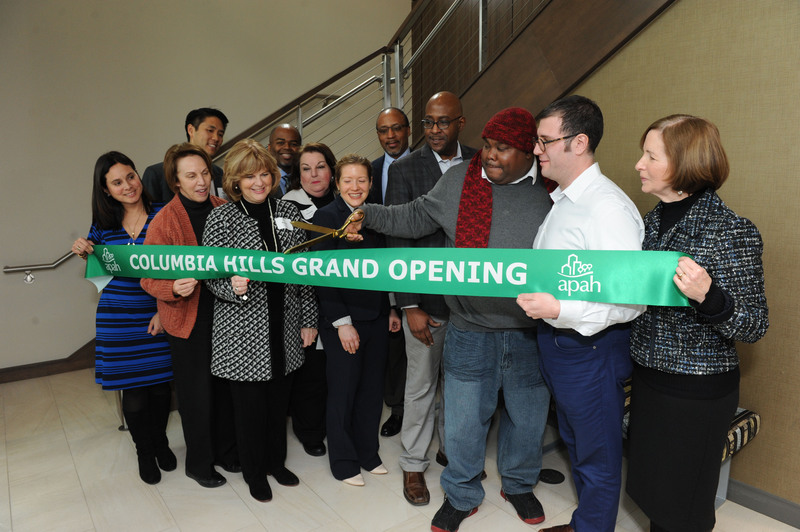 Arlington, VA (January 31, 2019) – Arlington Partnership for Affordable Housing’s (APAH) finance, design, and building partners, elected officials, neighbors, and APAH leaders gathered to celebrate the grand opening of the 229-unit Columbia Hills on January 30. The eight-story complex, rated Earthcraft Multifamily Platinum for its environmental and energy efficiencies, includes 13 accessible units to meet the needs of seniors and persons with disabilities. All apartments at Columbia Hills are affordable to households earning 60% of the area median income (AMI) or below. 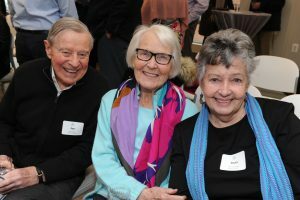 “I congratulate [APAH] on 30 years of increasingly ramping up its commitment to serve the most vulnerable in our community,” said Christian Dorsey, Arlington County Board Chair. Ten of the apartments are designated as permanent supportive housing to support members of our community who are coming out of homelessness or have other special needs. One such resident, Henry Ashby, thanked APAH and all those who made it possible for him to have a place to call home. “I’ve spent a lot of cold winters living in my car,” he said. “I feel very blessed to be here today as a resident of Columbia Hills,” as a snow squall passed outside as if to punctuate his appreciation. The $91 million project pioneered a complex and innovative hybrid financing structure, which combines the 9% and 4% Low Income Housing Tax Credit (LIHTC) programs to maximize equity for the project. 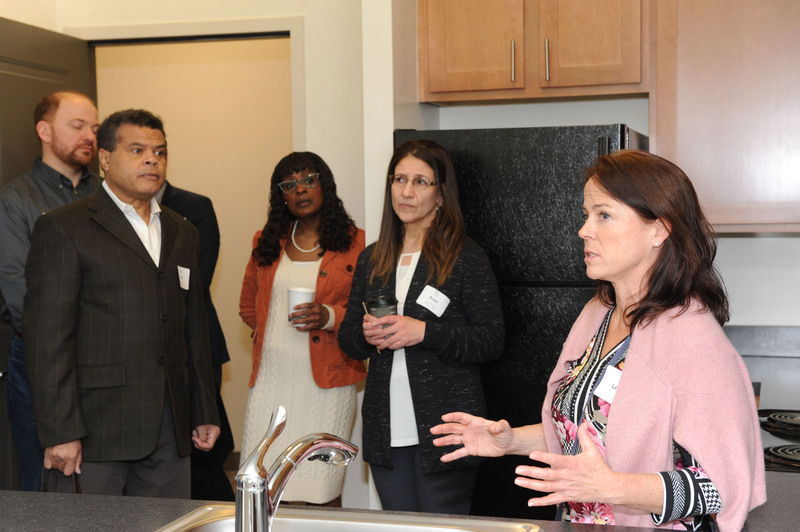 Susan Dewey, Executive Director of Virginia Housing Development Authority (VHDA) commended Columbia Hills, “it shows the innovation APAH brings.” VHDA is a long-time partner of APAH and administers the LIHTC program in Virginia. When APAH proposed the hybrid financing model to VHDA, it was the first developer in Virginia to do so. Now, says Ms. Dewey, about a third of their annual LIHTC applications use this financing model. Joking that banks “aren’t necessarily always ready to move first and fast,” Derrick Perkins, Senior Vice President and Market Executive for Greater Washington at Bank of America Merrill Lynch, noted that his team was pleased to work with APAH as they pioneered this new hybrid LIHTC financing deal, knowing it would be a success. “APAH’s one of our best nonprofit partners.” Bank of America is both the equity investor and construction debt lender at Columbia Hills. 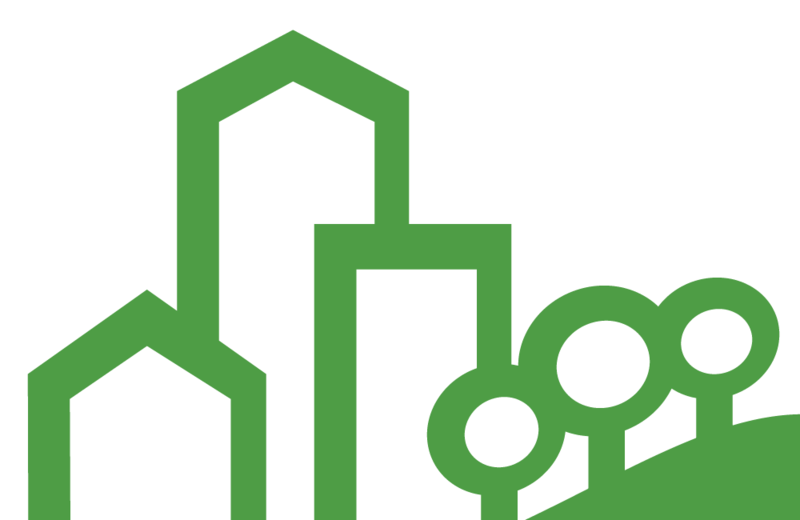 The issue of housing affordability continues to gain prominence in our local dialogue, especially with the recent announcement of Amazon’s selection of National Landing as the location for its HQ2. Growing awareness around this issue provides APAH, Arlington County, and others the opportunity to promote the tools, efforts, and investments to address. Cristeal, Arlington County Housing Director. Columbia Hills was the first multifamily project approved under Arlington County’s award-winning Columbia Pike Neighborhoods Plan. 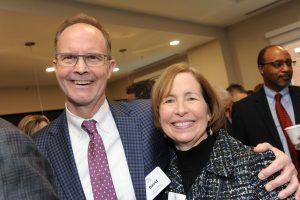 Columbia Pike is and was “a center for market affordable housing,” commented Nina Janopaul, APAH’s President and CEO. 6,200 affordable apartments were inventoried in 2012, and many were at risk. The Neighborhoods Plan envisioned no net loss of affordable homes on Columbia Pike through a combination of preservation and new density at existing affordable sites. She thanked county staff, commissioners, and elected officials for making the Columbia Pike Neighborhoods Plan a reality. Columbia Hills provides a major contribution towards the Neighborhoods Plan’s vision and the County’s Affordable Housing Master Plan. The Master Plan set a goal that by 2040, 17.7% of the County’s housing stock would be affordable to households earning 60% or less of the AMI.